can you tell me what the tile is in this bathroom? What color of Nublado Light Honed marble is used in this bathroom? Does this tile need frequent sealing to hold up without staining in the shower area? drooling over this bathroom. Well, almost but I am in love with it. - Question: it appears you used the 18x24 marble tile on the floor in the shower but I don't see a drain hole. Is this tiled on a level floor and if so, how does the water not leak all over the room and onto the nearby hardwood. Thanks! Hello, can you please tell me the brand and size of the tiles for this bathroom? We used the Nublado line of marble tile from Stone Source. It's a beautiful and subtle tile which closely resembles the clean aesthetic of limestone. Thanks for the inquiry. As for the drain, it was custom and designed by our firm. What kind of wood floor is that outside the bathroom? Can you tell me the manufacturer's name of the soaking tub? - What are the dimensions, please? Yes, thank you Evan, it is in fact the ios tub from Victoria & Albert Baths. Much appreciated! My husband Ken is an agent for these baths in the beautiful Southern Cape area of South Africa. He only sells things he believes in to be of the best quality and value and has done so for the past 16 years. Victoria and Albert baths fit the glove perfectly. Is a floor slope needed for the shower drain? - I love your frameless design and I am thinking about adding a stainless line drain, but worry about the water drain flow. This is a similar color to Bedrosians stone Ashen Gray. There are a lot of names with this particular stone. Other companies, call this White Oak. This it is a great product except for the confusion over the names. Ann Sacks calls the similar look Silver Cream, others call it silver cloud. Yet another name! It is all from the same quarry/region. The names are all part of marketing confusion to presumably justify the high prices. Not entirely sure. Call it what you will! 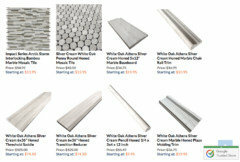 White Oak or Silver Cream it is $6.75 a Square Foot for the 12x24" tile. Here. With the amount of containers we buy, the quality is excellent as we are the only Google Trusted Store to actually be selling it. We have some great room scenes of the 12x24" and even a blog post of it being installed with out Whisper White Arabesque Tile in the shower here. Mosaics and trims make a great collection and we have them all from $10.95 a Square Foot. 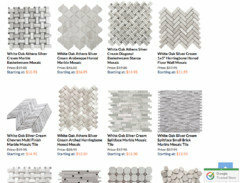 Mosaics of White Oak/Silver Cream etc,etc,..... from $10.95 a Square Foot. White Oak Trims and Thresholds to complete the job. All matched up by our stone experts prior to shipping. Pictures available upon request or simply order a sample. Our Collection is online: here. Do not be confused by huge distributors and their confusing names. Buy direct. How is explained here. It is a great looking product. If you ever make it to the Four Seasons in Disney World it covers that entire hotel. It is a maintenance free stone. Really is hassle free and going in my kids bathroom at some point! Doors...curious - Why a door surround for the toilet? Actually, a translucent film is intended to be applied to the interior walls of the toilet compartment to allow for some privacy. What kind of film?? Wondering if colors available. Need a privacy glass door for one end of a shared shower in adjoining master baths and am not crazy about the frost or patterned glass I've seen. Thank you! What is the color of this floor? Hi! To get a more accurate answer, you can forward your questions to info@turettarch.com or call the office at 212.965.1244 Thank you. Is the tile in the shower slippery when wet? Is there a tile coating? Hardwood to tile - What was used for the level transition between the two types of flooring? No shelves - I am building a new bathroom. I am building a shower of about 1.2 m by 2 meters. There are going to be long gaps in the walls for shampoo's etc. The bath Is a stand alone bath. In many of these designs there are no places once again to put soap, face cloth, shampoo etc. I've made sure I have gaps in the wall closest to the bathtub to place these items. I just seriously think people don't THINK LONG ENOUGH before building. I am also building my bidet and toilet into a sandblasted glass room, for more privacy with an extraction fan. The toilet will have a hidden cistern. Many homes these days are catching on to Windows set up high in a bathroom or a skylight for light. Windows can often ruin your set up for a great styled bathroom. I am having everything in white, with the tiles needed in white marble. The vanity will be bolted to the wall with a double basin, all in white, with the whole wall a beveled mirror. I like white towels and bath mats. The very best place to buy the most amazing towels etc is THE WHITE COMPANY in London. They send it out to any part in the world, I live in South Africa. In fact they sell other linen too which is pretty amazing. Think TEN times before you build just ONCE. Pretty (stunning) but impractical... - The simplicity is part of the appeal of course but I'm wondering where do I put my shampoo! Is there waterproofing on the toilet side/section/room? who is manufacturer of the shower glass -- where can I get it? - Was the glass custom and/if so who is the glass supplier? I would appreciate any leads. Grout - What is the grout color used? Transition from wood to tile - What did you use as a transition from the wood to the tile. It looks like a threshold, but doesn't look raised as wood often would. Moisture, - How does the steam from the shower get to the vent? Where is the drain for the bathroom. - Please let me know where is the drain for this bathroom. Where is this house located its beautiful. LOVE this bathroom, how is the glass secured to the walls? grandes vitres comme ca par dessus mur de briques, devant ouvert et bain-douche? Like wall tile color and style (Diana).